Nazeem Hussain is the star of his own critically acclaimed TV show, "Legally Brown", which aired on SBS in 2013. The show broke ground with it s boundary pushing content and has recently finished filming series 2. Prior to “Legally Brown”, Hussain was a regular on the Comedy Channel's hugely successful, ASTRA award winning "Balls of Steel" Australia. His self created character, Calvin Khan the Very Foreign Correspondent, saw his episodes achieve the highest ratings of the season and he returned in season 2. Hussain also starred on the cult hit Salam Café on SBS, which was nominated for a Logie Award in 2009, and has worked as a presenter on Triple J. He can also currently be seen on "The Full Brazilian", as a Brazil based correspondent covering the World Cup for SBS. Other TV appearances include Network Ten's "The Project" and on leading news and politics panel show "Q and A", alongside Malcolm Turnbull and Lindsay Tanner. Nazeem's also well known as a stand-up comedian and until recently was one half of cult political comedy duo "Fear of a Brown Planet"(FOABP) with Aamer Rahman. FOABP first appeared on the Australian comedy scene in 2008, with a sell8out run at the Melbourne International Comedy Festival. They were awarded the prestigious Best Newcomer Award that year and won over critics and fans alike. Hussain went on to regularly perform with Fear of a Brown Planet across Australia, including two shows at the prestigious Sydney Opera House in 2013. Nazeem has also performed stand-up on the Melbourne International Comedy Festival All Stars Gala, broadcast on Network 10 and the Sydney Comedy Festival Gala, broadcast on the Comedy Channel. He has performed several times at the annual Falls and Southbound festivals across Australia, to crowds of over 10,000 people. He has toured Australia as part of the Melbourne international Comedy Festival Roadshow. 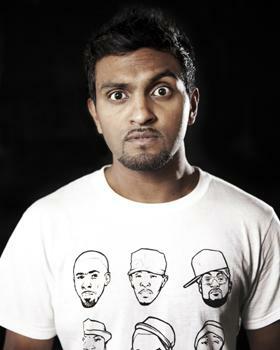 In 2011 Nazeem performed with Fear of a Brown Planet at the largest arts festival in the world the Edinburgh Fringe and received the highest review from the esteemed Guardian newspaper given that year. That same year FOABP was the focus of an episode of Australian Story. The episode documented Aamer and Nazeem s lives in Australia as well as their debut performances in Edinburgh and London. In September 2012, they returned to the UK for a tour and a date in Antwerp. Their Australian Story episode aired on the ABC to almost one million viewers nationally. Fear of a Brown Planet announced their split in February 2014.